Last summer before I acquired the Brunswick Panatrope "Cortez", I spotted a very impressive piece of furniture. When I opened the top, I noticed that it was a Victor "Credenza", as identified by the metal trademark plate. This was the first time that I ever saw this model. I knew it only from pictures, including the configuration of the upper works and the fact that it has a four-spring, two-barrel motor. The cabinet was almost mint, not even a scratch, but it was missing the most important part, the motor. The vendor mentioned that he had the motor-board and the gold-plated turntable platter inside, so I purchased it right away, and went home. I knew that I might be able to get a four-spring, two-barrel motor from either Don Woodrow or Bob Nix, so I e-mailed them both. Don responded first, saying that he could supply me with the motor, the price seemed very reasonable, and we made a deal. Luckily, I have a gold-plated tone-arm with a gold-plated pot metal Orthophonic "Credenza" reproducer, and the proper crank for a "Credenza". The reproducer was working, but not to its optimum. I sent it to Jeff Lutton in Woodland, California, to have it rebuilt. While it was in the process of being restored, I acquired two brass Orthophonic reproducers made for a "Credenza", one from Bob Nix, the other through e-Bay. In a month the Victrola "Credenza" was completed. It looks brand new, with the original lacquer finish. My preference is the rebuilt pot metal reproducer over the brass one. Although the motor, tone-arm, reproducer and crank are not the originals for that cabinet, they are original to the "Credenza". My "Credenza" is Canadian-made, as stated on the serial number plate: "Victor Taking Machine Co. of Canada Limited, Montreal. 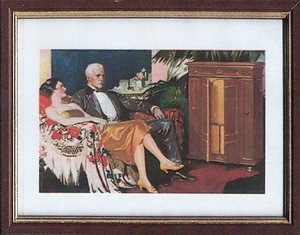 Credenza C7137A Patented 1925 - 1926". The cabinet is walnut, and it's a four-door model. The turntable is set off-centred to the right, so there is a place to stack records at the left. By late in 1924, Victor had to make major improvement in its products to stay viable. The Western Electric (WE) electrical recording system (Westrex System) was demonstrated to the Victor Talking Machine Company in early 1924. Victor's definitive agreement was signed, and the up-front licence fee of $50,000 was remitted one month before Columbia's agreement with Western Electric was signed (the agreement was signed April 22, 1925). * Victor designers, in cooperation with WE engineers, used the mechanical aspect of the electrical recording formula to design a mechanical phonograph to optimally play back electrical recordings. Several models were designed, and the flagship model was known as the Victor Orthophonic "Credenza", Orthophonic being Victor's advertising term for its electrical recording process. 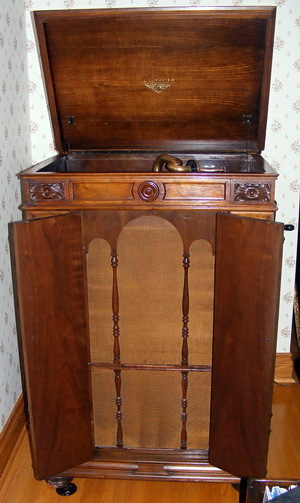 Orthophonic in Greek means "true sound", and the mechanism was housed in a cabinet styled in the fashion of an ornate Italian Renaissance Credenza**. The cabinet came in a choice of mahogany or walnut veneer. The finish was a smooth satin lacquer which was applied as fine sprays of stained lacquer in a closed room. The early "Credenza" model has two doors in front but, in less than a year this was replaced by a four-door model. Probably the engineers thought that it was awkward to open the two huge doors to have access to the storage space of the machine. Also the exposed storage space could be distracting to some serious listeners of music. Another change that the Victor engineers made from the early model, where the turntable sits in the middle of the machine, is that in the later model the turntable is off-centred to the right, creating a space for stacking records. The Victor Orthophonic "Credenza" and the rest of the Orthophonic models, the "Colony", "Consolette" and "Granada", were introduced to the buying public on "Victor Day", which was November 2, 1925. Victor workers must have struggled to place one demonstration model into each dealer's shop by the November 2 deadline. Within days, Victor was swamped with orders exceeding US$20 million. List prices ranged from US$95 to US$300, depending upon the cabinetry. Orthophonic Victrolas equipped with a Radiola ranged from US$375 to US$1000. *** Whether the machines were in US homes by Christmas is unknown. Electrically recorded discs were issued by Victor in early May 1925, but the record-buying public was not told that these were recorded with the new "electric" process, for there were not yet machines available to play electrically-recorded records then. In Canada, the first advertisement for the Orthophonic Victor "Credenza" and the lower priced "Granada" models appeared on Thursday, December 17, 1925, in the Toronto Daily Star, sponsored by Mason & Risch, 230 Yonge Street, and there had been a public presentation a week before in Toronto (TDS 1). The Canadian prices of the New Orthophonic Victrolas were as follows: "Consolette" $115.00; the 4-7 model $160.00; "Granada" $200.00, and "Credenza" $385.00, as advertised by The R.S. Williams & Sons Co., Limited, 145 Yonge Street, Toronto, on Tuesday, December 7, 1926 (TDS 2). The Orthophonic machines were advertised in The Toronto Daily Star from September to December, 1926, until two days before Christmas. The last advertisement for the Victor "Credenza" that I found in The Toronto Daily Star, was on Tuesday, February 1, 1927. Advertisement from R. S. Williams & Sons Company, Limited, 145 Yonge Street, Toronto, Ontario. Toronto Daily Star, Tuesday, December 7, 1926, page 8. "The acoustic sound reproduction of the 'Credenza' was designed to mirror the electrical process. It featured a re-entrant design based on the ideal logarithmic horn, the chamber split twice, vertically and horizontally, in order to 'fold' the horn upon itself, so that it would fit into the cabinet, (for it is 72 inches long), yet it provides the precise volume air column contained within the properly tapering rate of expansion of the horn chamber, as specified by Maxwell and Harrison's formula. ** Its design permits the dramatic increase in volume, the sibilants, and most of all improves the passage of the large bass notes. *** It also improves the lower-mid range portion of the acoustic spectrum. The use of the folded horn actually can cause increased internal reflections of the high frequencies, and decrease treble response. **** An air-tight design was developed from the vibrating diaphragm to the large open end of the internal horn. "You might want to restore moisture to the large internal horn. With time, especially if you live in warm and dry climates, the old horn, which is made of cheap gumwood, tends to dry, which is bad for sound transmission. First remove the grille, by removing the small finishing screws around the grille edge. The cloth is delicate, so do it slowly. Now you can see the inside horn. Remove the dust and other debris on the horn with a duster, then wipe with a damp cloth. It is essential that the horn is air-tight; if you see a major crack in the joints of the horn, seal these with a good quality wood sealant. To detect cracks, try using a flashlight when the room is dark. Stand with a bright light at the back of the machine after the backing has been removed. If anyone can see light while standing in front of the machine, you have cracks that need to be sealed. Interior detail of the author's Orthophonic Credenza. "From a drug store, purchase a 250 ml bottle of glycerol (also called glycerine). From a hardware store, buy a 500 ml bottle of methyl alcohol (also called methanol or methyl hydrate). Mix glycerol and methyl alcohol 1:1 in a can, and mix well. Using a long clean fibre brush, paint the internal horn. Slather on the mixture thickly. The old gumwood horn will absorb a lot of liquid. Be sure to slap the mixture way around the back portion of the folded horn. You may need to 'crawl' inside a bit. Make sure not to run the mixture onto the outside finish, so keep soft absorbing towels handy. Let it stand overnight. The next day, turn the 'Credenza' upside down after removing the turntable, tone-arm with the reproducer, and the motor-board with the motor. Then repeat the process. The alcohol evaporates, of course, but permits the glycerol to penetrate. Let the horn 'dry' for a day or two before returning the grille" (RJW). When I brought home my "Credenza", I noticed that there was a two-inch horizontal splinter lifting off the gumwood horn, and the gumwood horn was very dry. I performed the re-moisturizing process and, when fully dry, I glued back the wood splinter and sealed it. I noticed that there was a much more natural passage of the sound waves after the re-moisturizing process. Now to deal with the upper works of the Victrola "Credenza". The double air dash-pots lowered the lid gently and quietly. The restoration and tension adjustment of the air dash-pots will be dealt with in another article. The traditional Victor tapered tone-arm was replaced in this machine by the swan's neck shape of tone-arm. The earlier "Credenza" tone-arm assemblies were supported by a set of ball bearings at the base. Personally, I like the later style. As for the gold-plated Orthophonic reproducer, significant design changes were made. The fulcrum assembly in the needle-chuck was replaced with a group of magnetized ball bearings. The mica diaphragm was replaced with a 'duralumin' metal diaphragm, and the connection to the diaphragm was now in the shape of a spider. ***** The sound-box shell of the reproducer on the early "Credenza" was made of brass and had seven tear-drop openings and recessed lettering on the back. Later, Victor replaced the brass shell with a pot metal shell, because the latter was found to be more sound-neutral. The pot metal sound-box shell has nine tear-drop openings and raised lettering on the back. Now I know why I prefer the rebuilt pot metal reproducer over the brass model. 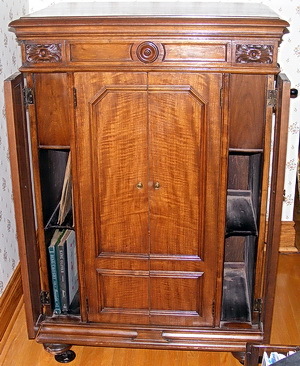 Record storage compartments in the author's Orthophonic Credenza. Victor files, cited in Robert W. Baumbach's "Look for the Dog", indicate 42,922 "Credenza" machines were made, all with spring-motors. Some 58,662 model 8-30 Victrolas were produced with spring-motors, and 8,847 were made with electric turntable motors. There were two types of electric motor available as an option. One was a simple AC induction motor, the other a complex AC/DC universal motor. In January, 1929, after the Radio Corporation of America (RCA) bought the Victor Talking Machine Company, the Orthophonic models were discontinued in favour of the all-electric models. 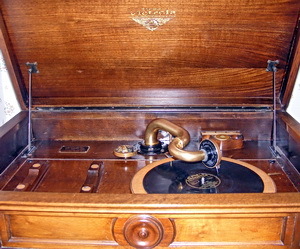 The "Credenza" will play electrically recorded discs manufactured from early May, 1925, to the 1940s, but will not reproduce all of the fidelity recorded into these discs since they were meant to be played with an electric pickup, amplifier and speaker (RJW). In my personal opinion, the "Credenza" has good bass, more distinct if you use a medium-loud needle. The sound is mellow and dispersed. The Brunswick "Panatrope" has good bass, but less full than the "Credenza". Vocal recordings are projected front and centre without being strident, and they have more volume. For some reason, I tend to play the "Cortez" more than the "Credenza". With the production of the "Credenza" and the model 8-30 totalling over 100,000 instruments, which is a lot, there must be a lot of them still around, compared to the Brunswick "Panatrope".